Since fewer and fewer narrow gauge locomotives are now serviceable it’s become very quiet around the Polish narrow gauge lines. However, the situation may become slightly better in 2016. The line at Znin is really very nice and their loco is too. 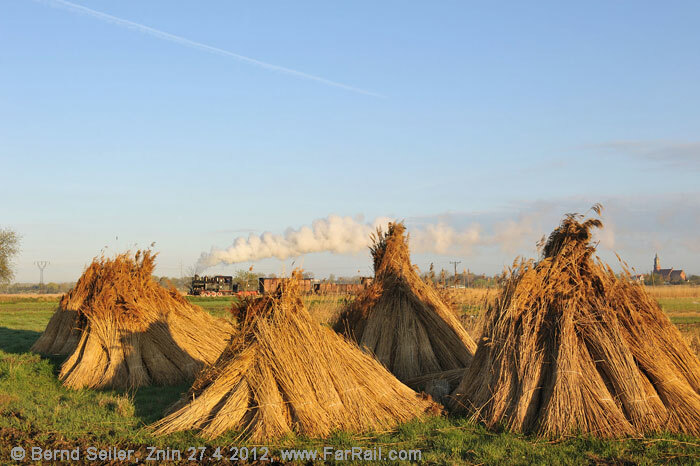 There is a privately organised standard gauge tour taking place in Spring 2016 and it makes a lot of sense to add this small narrow gauge tour. I’ll be forwarding questions about this privately organised tour due to take place after this tour to Znin to find out all the details. In April the tracks are still not overgrown by weeds and, hence, are visible. We’ll be arriving shortly before the normal tourist season starts and we have a good chance of finding trees in blossom along the line and the meadows yellow with dandelions. 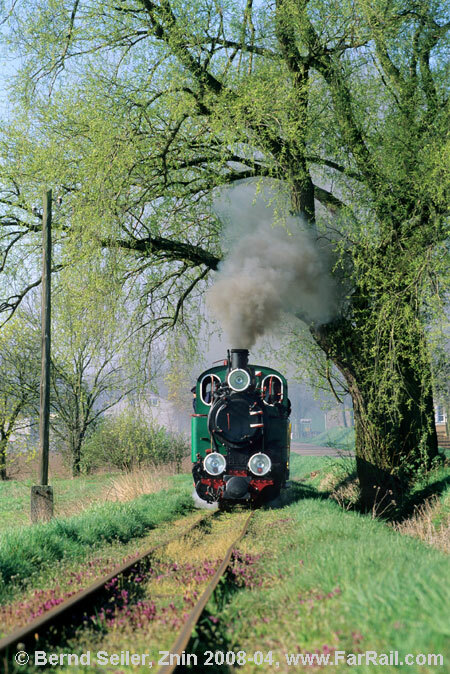 Our focus lies on authentic trains which could have been seen some 20 to 35 years ago on Polish narrow gauge lines. As far as possible we’ll replace the names of the new owners with the original PKP (Polish State Railway) lettering. As usual we’ll use the beautiful early morning light to be rewarded with steam exhaust from the morning chill and we’re also planning some night shots. Sunrise in Poznan is at 05.33, sunset at 20.09 hrs (April 25th). By noon the light is already harsh, so we’ll take a break for us and also for the loco crews around midday. Same again as yesterday. Our charter bus will take us back to our accommodation. 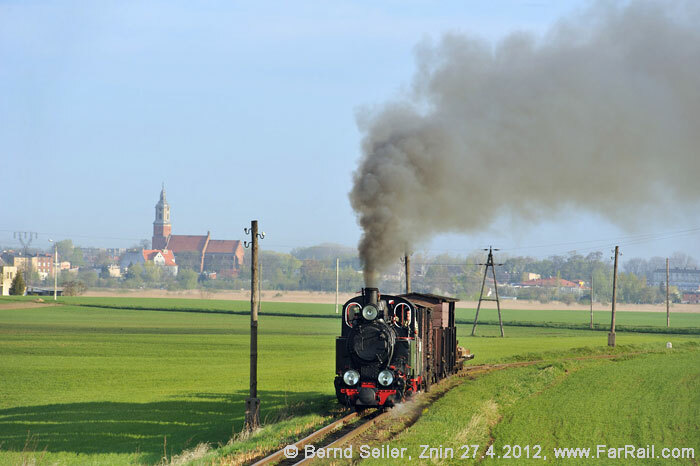 Charterbus back to Gniezno station  or you’ll join the private standard gauge steam event further in the south of Poland. By car it will take you about four hours to get there. The return train journey to Berlin with EuroCity EC 54 starts at 10.00 am with arrival in Berlin at 13:43 hrs. 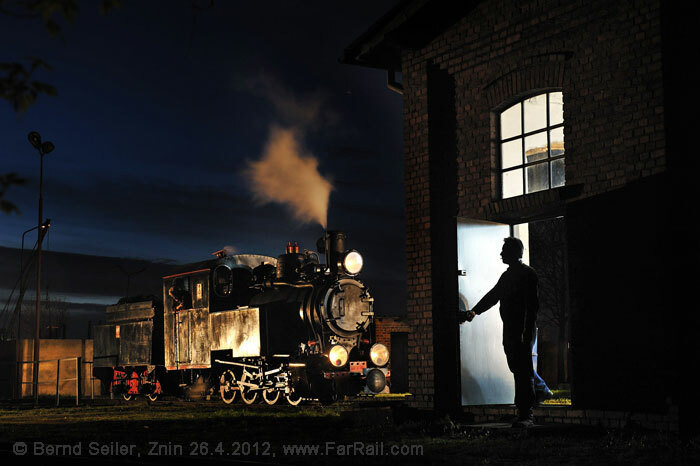 You can book tickets through FarRail Tours if you like. Except for seasonal tourist traffic this once large railway network ceased regular operation in the mid 1990’s. The first tourist train ran here as early as the late 1970’s, so the railway is used to being frequented by tourists. Unfortunately, almost all the coaches have been rebuilt as colourful, large windowed or open tourist coaches which have nothing in common with the regular trains, so we cannot use them for our train. Already, nine years ago, we chose four freight wagons from the still available ones to be overhauled for our photographic purposes. They were a flat wagon with bogies, a 4 wheel flat wagon, a 4 wheel open wagon and a 4 wheel covered wagon. Some of the wagons have since been freshly painted but we hope that the wagons will look a little weathered by next year. We also hope that one of the authentic green passenger coaches will be overhauled in April, so we can use it for a mixed train. If not, we’ll travel in or on the freight wagons. We’ll change the train composition from time to time, but you should keep in mind that the number of serviceable wagons is very limited. Of the once 76 km line, there remains only 12 km, from Znin (Znin) to Gasawa (Gonsawa). Our locomotive will be Px38 805. This 0-8-0 is painted in black, as it used to be in its last years of regular use. It was painted green for a number of years in tourist operation as well as some years in regular service. We will do some adjustments to make it look like a real PKP engine again. The museum of the railway is in Wenecja. We’ll have plenty of time to explore the extensive collection; the ticket price is included in the tour price. Virtually all locos there are painted green which was the common colour of a large part of the Polish steam loco fleet. The line passes though rural countryside, mostly flat but with a few hilly parts. Large fields, little lakes, small forests and narrow roads are the surroundings of our line. The tour is designed for the demanding photographer and video film maker, and for the lover of authentic narrow gauge steam trains. Our accommodation is simple but clean and quiet; it has no spa or fitness centre. It’s a newly refurbished building which can be rated as a youth hostel. We’ve booked the whole building, so there won’t be any guests other than us. Poland is country of the European Union. Following a deep recession, the economy is now growing strongly, even during the recent worldwide recession. However, the condition of the roads and railways leaves something to be desired occasionally. Traffic may follow different rules from those you are used to. The official language is Polish, and the younger population often has a decent command of English. Older citizens often speak some German. Petty crime such as theft or pick-pocketing is no worse than in other European countries. Nevertheless, you would be well advised to keep a close eye on your photo equipment, as always. Our hostel/hotel can be considered as very secure. Please be considerate to others when taking pictures since all participants want to bring home high quality shots. Please do not wear high-visibility jackets etc. You should wear strong shoes. To make this tour successful for you, you should bring a tripod. We will take some night shots, so please be prepared. We’ve arranged breakfast (early in the morning) and lunch (maybe later as usual), but not dinner. Breakfast and lunch are included in the tour price. Electricity (220V, 50 Hz) is available in our accommodation, power cuts are very uncommon. You may need an adaptor for the sockets (they have a special safety pin in the centre of the socket). Mobile phone coverage is very good. Poland uses normal European GSM standards. Please take care as you will have to pay roaming costs for incoming phone calls as well as outgoing. 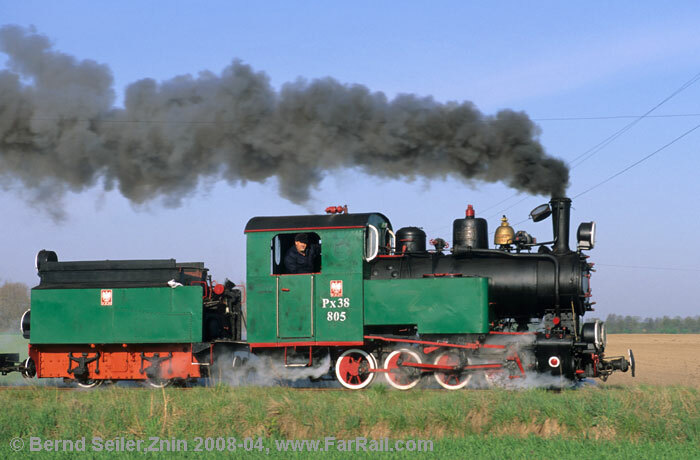 Znin has only one serviceable Px38 steam locomotive. As there is no spare, technical problems may put us in a situation where we can’t offer the proposed steam train. 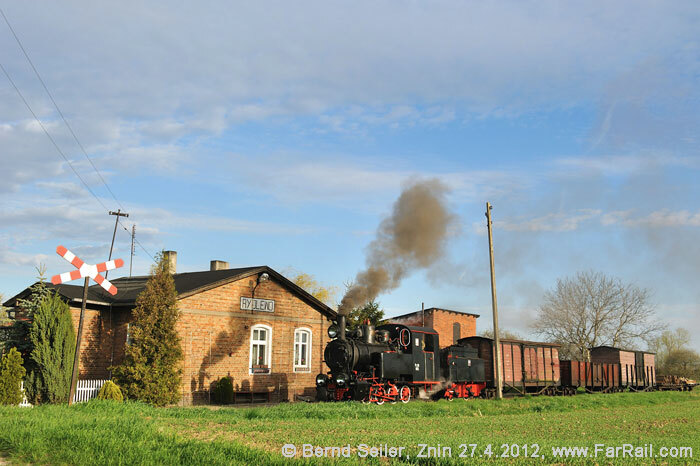 There is a second serviceable steam loco in Znin, a 0-6-0 type “Las”. This type of locomotive was in use mainly for shunting and serving the sugar mill in Znin, but rarely on the line. Just in case of a serious problem with the Px38, we may need to use this locomotive as there is no other substitute. In addition you need to consider that the condition of the railway track is, sometimes, very poor. Derailments may occur. Hence we cannot guarantee anything. 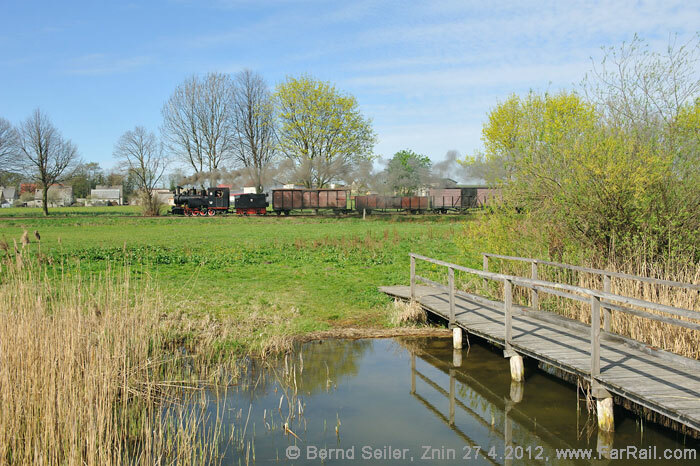 We’ll use wagons which may not have been moved for many years in some cases except on previous charter train events. We might have to sort out problems which prevent an early start as planned or the use of a certain type of wagon. Please be prepared that not everything will run as ordered. However, you can be sure that we’ll get a decent amount of good shots even if the railway fails to deliver on some points. Any compensation, financially or otherwise, is not possible in any circumstance. Please bear in mind that transportation in Poland may partly fall short of the newest EU and North American safety standards. Always use common sense when crossing roads and railway tracks. FarRail Tours cannot be held responsible and will not accept any liability whatsoever in the case of any accident, damage or delay. We suggest you take out a comprehensive overseas accident and health insurance policy. 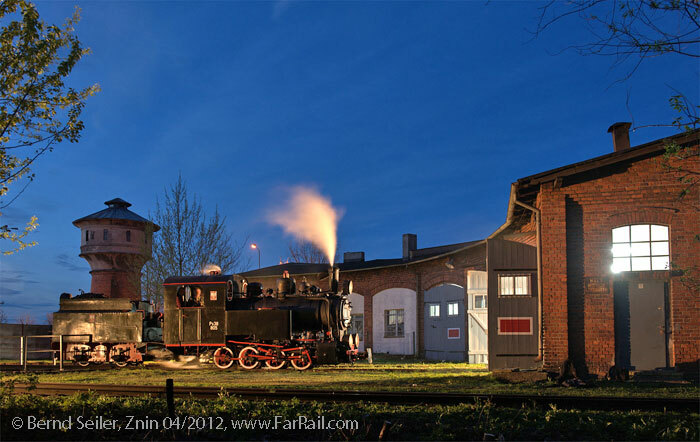 The tour starts and ends at Gniezno (standard gauge) railway station. I will guide the tour from and to Berlin. You can board the tour in Berlin, Gniezno or fly to Poznan and hire a car there. When you book early enough the train ticket from Berlin to Gniezno is 39 Euros per direction.